The river terrapin is a species of freshwater turtle found in Cambodia, Thailand and Peninsular Malaysia. Unlike its sea turtle cousin, which can lay 100 eggs every 12 days (with only one in 3500 making it to adulthood), the terrapin nests just once a year, producing a maximum of 40 eggs annually. As if these low numbers weren’t enough, people living near nesting sites have traditionally consumed terrapin eggs, giving little thought to conservation or sustainability. This has led to the river terrapin being listed as critically endangered by the International Union For Conservation of Nature (IUCN). 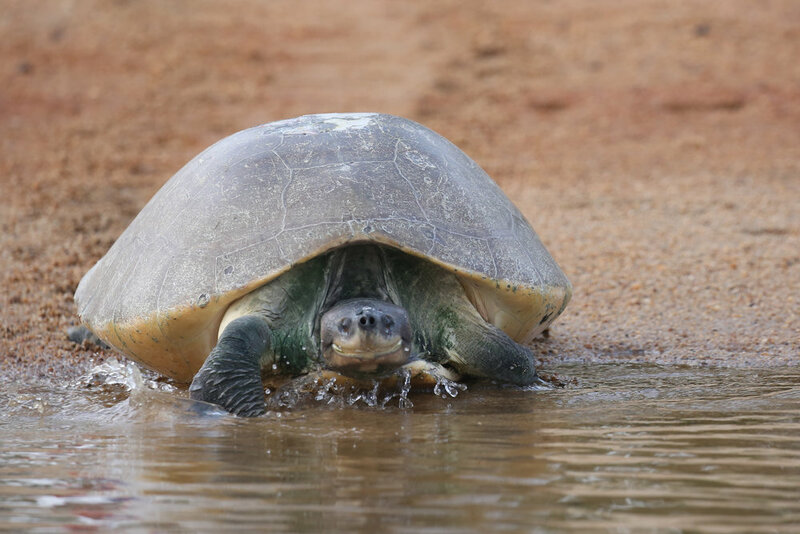 The Turtle Conservation Society (TCS), located in the Malaysian state of Terengganu, on Peninsular Malaysia’s east coast, is an NGO committed to saving the river terrapin through research, conservation, and public outreach. TCS was founded in October 2011 after receiving a $30,000 grant from U.S. Fish and Wildlife. “We had one big aim, to restore the depleted wild population of freshwater turtles in the country,” says TCS co-founder Chen Pelf Nyok, who runs TCS with the help of volunteers and seasonal staff, but is the organization’s only full-time staff member. When TCS was founded, data on the river terrapin was incomplete. The turtle was only known to exist in two major rivers, so TCS conducted a survey to determine the terrapin’s presence elsewhere. They also studied the nesting habits of the terrapin, which were not known at the time. TCS also started egg protection and turtle awareness programs, both of which continue to this day. The egg protection program collects terrapin eggs each nesting season, which runs from February to March. TCS incubates and hatches the eggs, and raises the hatchlings for four or five months before releasing the young terrapins into the river. Thus far, more than 2400 young terrapins have been hatched and released. TCS’s turtle awareness program involves going to local schools to talk to children about the plight of the terrapin. Though the adults can see the results of the dwindling terrapin population for themselves, as the amount of eggs they have been able to collect has declined over the last 10 or 20 years, old habits die hard, which is why TCS puts an emphasis on reaching the kids. New York City based photographer Vera Niewenhuis recently visited Terengganu to document TCS’s research and conservation efforts. Once there, she found herself not just photographing turtles, but a whole community coming together for a cause. Her visit coincided with Terrapin Independence Day, the day in September when TCS releases the turtle hatchlings into the Kemaman River. The day is truly a community event, often resembling an elementary school sports day, with face painting, races and a water balloon toss. Community members are then able to gather on the beach to hold the young terrapins, before releasing them into the river with a head start on life, courtesy of TCS. The turtles get special markings on their shells for research purposes, so that TCS will know who they are if staff encounter them later in life. Though accurate data regarding a success rate won’t be known for some time, local subsistence fisherman who previously had only encountered adult terrapins have reported seeing young terrapins in the river for the first time. Niewenhuis says that through education and by involving local people in the turtles’ release, TCS has been able to bring the local people on board with the conservation efforts. “I really hand it to Pelf, because she’s got an amazing way of engaging this small town,” says Niewenhuis. “She’s done a lot to make them come together for this cause and make a difference”. Click here to learn more about the Turtle Conservation Society and how you can show your support.